The Bellman Alarm Clock Classic for the Hard of Hearing uses extra loud sound and bed shaker vibration to help ensure you never oversleep. 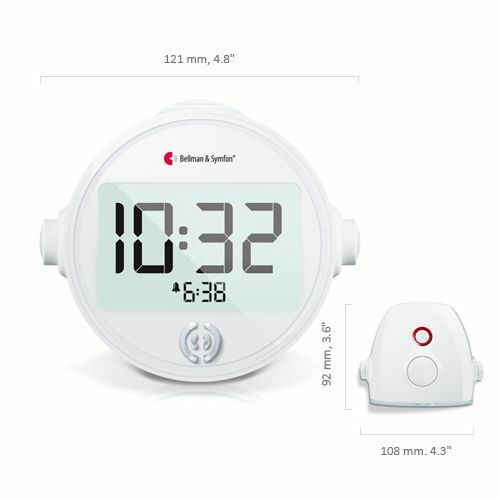 This alarm is therefore also ideal for particularly heavy sleepers who need an extra push to get them up in the morning. Dependable and efficient, the Classic Bellman Alarm Clock will be there when you need it most. Start your day right with the Bellman Visit Alarm Clock! Connected to a powerful bed shaker which is placed under your mattress or pillow, vibrations alert the user when it's time to wake up. The device can also emit an extra loud alarm signal, allowing you to use one or a combination of these alerts. The clever clock features a smart snooze function, reducing the time intervals from nine to two minutes, and a multiple tone alarm signal that sweeps through the frequencies, ensuring you will be able to hear it. Furthermore, a back-up battery reduces the risk of the alarm clock running out of power, so you can be confident that your alarm clock will always be ready to perform. The Bellman Alarm Clock Classic is for indoor use only.